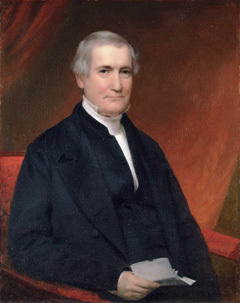 James Carnahan, a member of the Class of 1800, served Princeton longer than any other president. After graduation, he served as a tutor in the College, studied theology with President Samuel Smith, and then preached for six years. He left the pulpit because of a throat ailment that troubled him all his life and established a classical seminary in Georgetown in Washington, D.C. He had been there 11 years when he was elected president. Carnahan was unprepared for his new task. A courtly schoolmaster, he didn’t know what to make of the near anarchy that had resulted from the conflicting views of students, faculty, and trustees. He watched sadly as enrollment dropped from 148 to 66. He became so discouraged that he considered closing the institution; John Maclean, then a professor and soon to become vice president, saved the day by proposing a plan for strengthening the faculty with the help of alumni. Under this plan, the venerable James Madison, Class of 1771, was invited to become the first president of the alumni association. Many years later, remembering that Madison had stayed on for a year of graduate work, the Alumni Council gave his name to a medal awarded annually to an outstanding alumnus of the Graduate School. With funds raised by the alumni, Carnahan strengthened the faculty. Modern languages became permanent features of the curriculum. Student enrollment doubled, and the faculty tripled. The College prospered again. *Philip Lindsly served as acting president from 1822 to 1823. James Carnahan (1775–1859), Class of 1800.